Benjamin Franklin turkey symbol: Why he hated the bald eagle for the Great Seal of the United States. Did Benjamin Franklin Really Say the National Symbol Should Be the Turkey? You have got to see his original design. Illustration by Lisa Larson-Walker. Source paintings via Wikimedia Commons. That’s how I wish it went down, but that’s not how it went down. The choice to include the bald eagle in the Great Seal of the United States was made after years of the kind of congressional congestion that remains a defining characteristic of the body. As you might expect, it started with a committee. The Continental Congress assigned the task of designing the seal to the Founding Father dream team of Benjamin Franklin, Thomas Jefferson, and John Adams on July 4, 1776, just after signing the Declaration of Independence. A second committee was formed in 1780 but also failed to produce a worthy design, as did a third committee in 1782. Exasperated, Congress turned the duty over to its secretary, Charles Thomson, an orphan who had risen to become the “Samuel Adams of Philadelphia” (not to be confused with Slate’s Sam Adams of Philadelphia or the Samuel Adams brewed near Philadelphia). By late 1782, Thomson succeeded where all others had failed, producing a description immediately accepted by Congress. Thomson submitted a description only, though, not a drawing—probably because his sketches looked like something doodled on the back of my middle school notebook. The most famous story to come out of the Great Seal ordeal is that Franklin preferred the wild turkey to the bald eagle. This story has more truth to it than some others about Franklin (forget everything you’ve heard about the kite-flying experiment), but it’s not so simple. An eagle first appeared in a Great Seal proposed by William Barton of the 1782 committee. Barton’s avian-centric design (it also includes a dove and a phoenix) depicted an all-white eagle of a kind that does not exist in nature. Thomson’s description, however, specified “an American Eagle on the wing & rising proper.” Though golden eagles are also present in North America, “American Eagle” meant bald eagle, a common sight in the Colonies. Before and after his time on the first Great Seal committee, Franklin had a number of ideas for the emblem of the United States. In an anonymous letter to the Pennsylvania Journal in 1775, Franklin pondered the virtues of using the rattlesnake as the coat of arms of America. His assessment was perhaps overthought—Franklin recognized both that a rattlesnake “never begins an attack, nor, once engaged, ever surrenders” and that rattlesnakes huddle together in winter for warmth, just like Americans do. (I guess?) Though it didn’t make it onto the Great Seal, Franklin’s rattlesnake comparison and the related “Don’t Tread on Me” slogan and other symbols have been in the limelight in recent years. 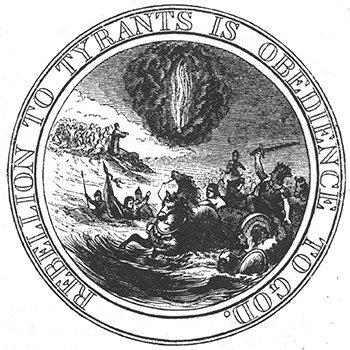 When Franklin served on the committee with Jefferson and Adams, however, he proposed something much harder to draw: Moses standing on a shore, backlit by rays from a pillar of fire, while an Egyptian pharaoh and soldiers drown—in an uncomfortable level of detail—in waves of the parted Red Sea. Perhaps a little aggressive for a Great Seal, the proposal was rightly dismissed. Sick burn, Franklin! Stealing food out of a baby’s mouth! Got anything else? Bam! Franklin is being pretty selective with his facts, though. While, yes, bald eagles will steal food from ospreys and eat carrion, they’re excellent fishermen. Additionally, birds of prey—including hawks and owls—are constantly being harassed by smaller birds. In fact, birders know to follow the sound of scolding birds in order to find these larger birds. For in Truth the Turkey is in Comparison a much more respectable Bird, and withal a true original Native of America. He is besides, tho’ a little vain and silly, a Bird of Courage, and would not hesitate to attack a Grenadier of the British Guards who should presume to invade his Farm Yard with a red Coat on. I am in agreement on all points. Turkeys are indeed native to the United States, are a little vain and silly, and are not to be messed with. But do we really want our national symbol to be something we cook and eat every Thanksgiving? Even in Franklin’s time, it would have been wrong to cover our flag with gross-looking neck wattles. Did Franklin write that he preferred the turkey over the bald eagle as the national symbol? Yes. Was he serious? I’m not so sure. In addition to the contradictory evidence about the rattlesnakes and his drowning-Egyptians proposal for the Great Seal, and the fact that he had elsewhere written that eagles were “an Emblem of Victory,” there’s the not-insignificant matter of to whom he wrote the famous letter. Was it to Congress, formally requesting a new Seal? No. Was it to Thomas Jefferson, to commiserate over their failed proposals? No. It was to his daughter, Sally Bache. Thus, I think Franklin’s words should be taken with the same grain of salt that I take when my dad emails me after the Patriots lose to say that Tom Brady should be traded. Of course, the bald eagle won out over the turkey, the phoenix, and Hercules as the star of the Great Seal. Despite the slanders of our most beloved Founding Father, the bird is strong, powerful, and impressive: a fitting symbol of America. Now if we can just learn to live with what it truly sounds like.